Earn up to 4,592 reward points. 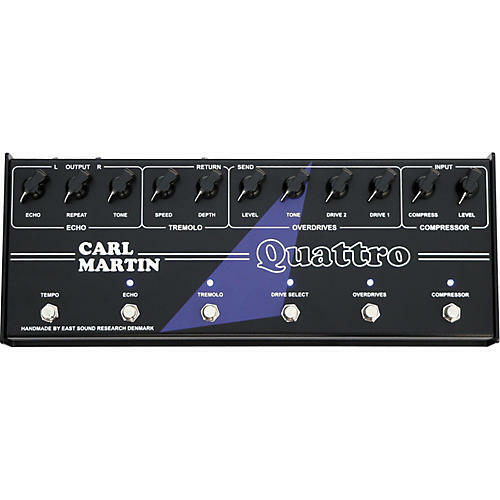 The Carl Martin Quattro Guitar Multi Effects Pedal begins with Carl Martin's award winning compressor/limiter circuit with single controls for compression and level. The 2-channel overdrive has switches for on-off, and for selecting between the crunch and high-gain stages, and controls for tone and level. In classic fashion, the tremolo has speed and a depth control. Finally, the vintage style echo has controls for level, tone, repeat and tap-tempo, as well as an on-off switch. No hard to read screens, no menus to scroll through, just set-up and play. One of the simplest multi-effects on the market! There is also an effects loop built in between the overdrive and tremolo effects for that special drive or fuzz pedal that is part of your sound. You also get famous Carl Martin build quality, ultra quiet switching, a high quality on-board regulated +/-12V power supply which allows the use of the finest components allowing the greatest amount of headroom, and low output impedance which leaves your amp sounding exactly like your amp. Compressor: Compression is good for overall use. It smoothes out your uneven dynamics and increases sub tones. It also gives more depth, body and sustain. This is especially great for solos. Just set the level knob to match the desired solo level. For more compression turn the compress knob clockwise, and adjust your level to match the bypass level. Overdrives: Drive 1 is the crunch channel, Drive 2 the high gain channel. To enter drive 1, press the drive switch and set the level to match the bypass level. The tone knob works like a high cut filter. Set the knob at full clockwise for high crisp tone or turn the tone knob counter clockwise for warm, round tone. To enter drive 2 leave the drive switch on and press the select switch. The level and tone knobs are the same on both channels. Tremolo: The tremolo effect is a very useful vintage effect found on many old tube amp's. The tremolo goes from light and easy to a mind-blowing chop. The knob works clockwise for more effect and depth. Echo: The echo effect is designed to emulate the old vintage tape echo units, including all the low-fidelity noise and distortion. It has extremely musical and warm echo, so don't expect any clean sterile digital delay here. To enter the echo mode press the echo switch and set the echo level on the echo knob. Turn clock wise for more effect. Turn the repeat knob clock wise for more repeats. The tone knob works like a filter with clear crisp echoes in the full clock wise position and warmer vintage style echo when turned counter clockwise. The echo time is set on the tempo tap switch and it goes up to 1000 milliseconds. Please note that once disconnected from power, the echo time will revert to the shortest time. Loop: This is a serial loop placed between the overdrives and tremolo, so it's possible to add another of your favorite distortion boxes with the compressor and overdrive in front of it, and the tremolo and echo after it. It is also the right place to put in another modulation effect like a chorus, flanger or phaser. The loop has low impedance out and high impedance return. The Quattro is not true bypass, however, the high quality output buffer circuitry ensures noise free operation with long cabling from unit to amplifier, even on large stages.